As we all know, the world is going through an especially difficult time financially at the moment. This is, in part, due to people’s greed. People have been seduced by material things, things they cannot afford, and so they have bought them on credit. They have been given mortgages they can never repay. They are living a life on borrowed money. Gautama Buddha’s words above seem very relevant at the moment. We are bombarded everyday with advertisements telling us we need this or that to make our lives complete. It seems our culture implicitly values desires, and we evaluate the worth of people by what they own. Corporations, hungry for profit, tell us that ladies need this cream to look young, men need to use this razor to look handsome, children need these toys to be happy, families need to drive around in a big gas-guzzling SUV—we are constantly barraged by new products. There appears to be a new smartphone, TV or electronic gadget released every week. Greed seems to be considered a virtue and not something to avoid. 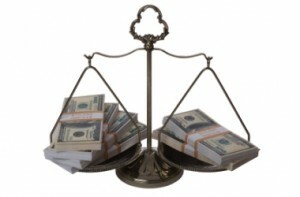 A balanced life is one whereby we ensure that our income exceeds our expenditures. This is not an easy task to undertake as we look around and see that everyone has an iPhone or iPad, and that includes our peers, friends and family. The pressure is on us to conform, but we have to resist this pressure. It isn’t easy and takes a lot of discipline, but it is doable. The trick is not to be led along by our desires. We have to look at the things we need to get by and the things that are just a luxury. Buddhism would not say you shouldn’t have luxuries, but it would say that we need to prevent ourselves from getting attached to them. There is no suffering in products, but there is suffering in our attachment to these products. Obviously, we need food, clothes and a roof over our heads—these are our basic needs—but we must think carefully about other things that set off our desires. If you need the latest smartphone and have the money to cover it, then go ahead. However, if you cannot cover the cost and need to pay for it on credit, I would say leave it until you have saved enough money. I always feel happier when I have saved for something; the product then seems to mean more to me. So check your desires, and don’t let peer pressure or multibillion-dollar companies make you overspend. Live a balanced life because you will feel a lot happier and less stressed by acting in this way—no matter what the advertisers tell you. Taken from the forthcoming book – Life’s Meandering Path.